Change drives todays business, it is the only constant. Unfortunately, the processes that businesses use are decades old and built for a time that was much more predictive. Effective Complex Project Management is the first book to define a practical and rigorous yet adaptive solution for addressing rapid change in projects. Todd C. Williams, President, eCameron, Inc.
With technology continuing to invade the business world and the convergence of complexity, uncertainty, and constant change, a whole new class of projects has emerged for which traditional project management models such as Waterfall are totally insufficient. These are called complex projects. Extreme Project Management models and a variety of Agile Project Management models such as Scrum, Rational Unified Process, Feature-Driven Development, and Dynamic Systems Development Method have emerged, but project failure rates have not been measurably reduced. Effective Complex Project Management offers a proven solution to managing any project that must succeed in the face of organizational complexity and market uncertainty, in the form of an adaptive complex project framework. Developed, refined, and validated through 20+ years of client experiences and feedback from project management thought leaders, this framework and robust methodology has demonstrated a favorable impact on project and program management success rates. 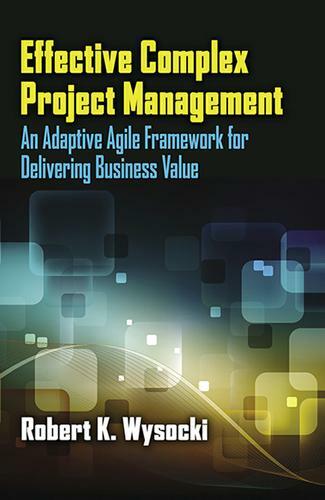 Dr. Wysocki demonstrates that for program and project managers to be consistently successful in managing complex projects, they need to include in their project management portfolio of processes an adaptive framework that continuously analyzes and adapts to changing and modifying conditions even to the point of changing project management models mid-project. The authors adaptive complex project framework is currently the only robust tool to offer an orderly approach to do just that. When applied and managed correctly, this intuitive framework that proceeds from ideation to set-up to execution has proven to deliver on the purpose of programs and projects without fail, in the form of desired business value. Robert K. Wysocki, Ph.D., has over 45 years combined experience as a project manager, business analyst, information systems manager and business process expert, consultant and training developer and provider. This thought leader and best-selling author has written 24 books on project management and information systems management. His books have been widely adopted by executives, practicing program and project managers, business analysts and consultants, as well as by more than 350 colleges and universities worldwide. Dr. Wysocki has trained more than 10,000 senior project managers and he is a sought-after speaker. In 1990 he founded Enterprise Information Insights, Inc. (EII), a project management consulting and training practice specializing in advanced and innovative project management methodology design and integration, business process design, project support office establishment and the development of training curriculum. His client list includes AT and T, Aetna, BMW, Eli Lilly, IBM, Novartis, Ohio State University, Sapient Corporation, The Limited, The State of Ohio, Wal-Mart, Wells Fargo, ZTE, and several others.